A brand of crayons being sold at Dollar Tree and multiple online stores tested positive for asbestos, according to the U.S. Public Interest Research Group (U.S. PIRG). According to the report, Playskool crayons purchased at a Dollar Tree store in Chicago tested positive for trace amounts of asbestos. The product, a 36-pack of crayons, are also being sold on Amazon and eBay. 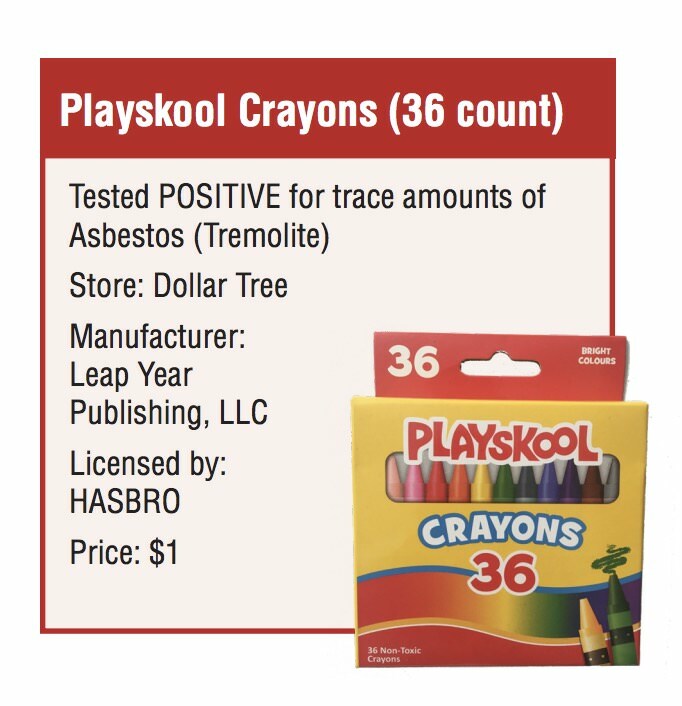 "We tested six types of crayons for asbestos and one tested positive for tremolite: Playskool crayons (36 count) that we purchased at Dollar Tree. We tested the green color crayon. Asbestos is a known carcinogen and can lead to serious health conditions, including lung cancer and mesothelioma. Pictures of the tremolite fibers taken from the laboratory are included in Appendix A." The research group is calling on Dollar Tree and Playskool to recall the crayons and remove the product from store shelves. They also recommended the company contact customers to warn them about the product. “Based on our testing, we know that most manufacturers make safe school supplies. We’re calling on the makers of unsafe products to get rid of toxic chemicals and protect American schoolchildren,” said Kara Cook-Schultz, U.S. PIRG Education Fund Toxics Director. "Product and children’s safety are top priorities for Hasbro. We are conducting a thorough investigation into these claims, including working with Leap Year, the licensee of the product." "The safety of our customers and associates is our top priority. Our company utilizes a very stringent and independent testing program to ensure our supplier products meet or exceed all safety and legal standards. We are aware of the report and have since re-verified that each of the listed products successfully passed inspection and testing." According to the Environmental Protection Agency, exposure to asbestos only occurs when asbestos-containing material is disturbed and particles become airborne. U.S. PIRG also publishes an annual report about toy safety. Last year, the group identified two fidget spinners being sold at Target that contained over 300 times the legal limit for lead in children's products. “The safest schools are healthy schools,” said Coalition for Healthier Schools Coordinator and Healthy Schools Network Founder and Executive Director Claire Barnett. “As children across the country get ready to return for the new semester, the national Coalition is urging parents to join us in this fight."